Habit: Tree < 20 m, evergreen; trunk bark furrowed, scaly, gray or red-brown; young twigs tomentose. Leaf: 5--8 cm; petiole 5--18 mm; blade oblong to oblong-ovate, adaxially +- finely tomentose, glabrous in age, dark green, abaxially densely tomentose, sparsely tomentose in age, dull, gray-green, tip acute to obtuse, margin entire to crenate or mucro-toothed. Fruit: cup 20--30 mm wide, 6--8 mm deep, saucer- to bowl-shaped, scales thick, tubercled; nut 20--35 mm, widely ovoid, distally rounded, shell +- woolly inside; mature in year 2. Ecology: Canyons, slopes, woodland; Elevation: < 600 m. Bioregional Distribution: ChI; Distribution Outside California: Baja California (Guadalupe Island). Flowering Time: Apr--May Note: Hybridizes with Quercus chrysolepis. 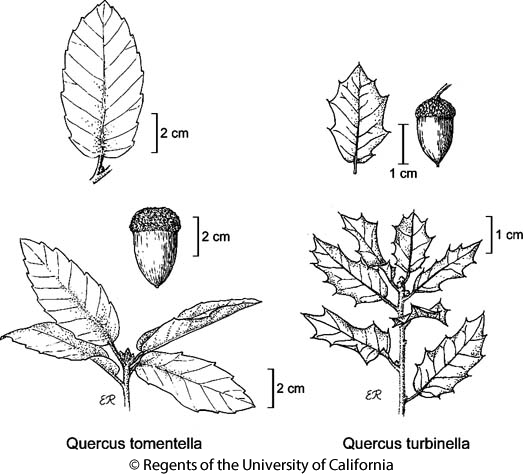 Citation for this treatment: Thomas J. Rosatti & John M. Tucker 2014, Quercus tomentella, in Jepson Flora Project (eds.) Jepson eFlora, Revision 2, http://ucjeps.berkeley.edu/eflora/eflora_display.php?tid=40764, accessed on April 21, 2019.